Marilyn Pratt organized the BPX Process Design Slam at SAP TechEd 2009 for the second time. There are some wiki pages dedicated to the event. More on my SDN blog about the event. Twitter is a great platform to follow event attendees, type in the hashtag in some Twitter app and you read all about the event. Try it this week with SAP TechEd Bangalore, use the hashtag #sapteched09. SAP did a great job integrating Twitter into the event. They were promoting to use it on beforehand. And during the event @sapteched kept us up to date. You just could not get by all the #sapteched09 tweets, SAP installed screensavers all over the place. @ttrapp You are a real #sapteched09 die hard. Still in a session and tweeting. I am at airport, good to have met with you. Thanks to @fotolouis I could complete our wiki for the #bpxslam09 http://bit.ly/1FOMAi #sapteched09. RT @jpenninkhof: Feeling a #sapteched09 after-dip coming up.. :S << Already in it, don't want to leave so many great people! http://twitpic.com/ndqki - Open discussion on experiences with agile and SAP at 14:30 in expert lounge 5, #sapteched09. Share experiences and ideas on Agile and SAP at 14:30 in expert lounge 5 at #SAPTechEd09. Feel free to join and participate. RT @NopaTechEd09: @tbroek #SAPInsideTrackEindhoven love to join you on my BI experience #sapteched09 at #SAPInsideTrackEindhoven << Great! RT @ttrapp: @thorstenster Do you have an idea how to promote #SAPInsideTrackBonn at last day of #sapteched09? << Tweet a lot! Agile meet up in community clubhouse at 14:00. Come join me discussing making SAP more Agile at #sapteched09. @aahoogendoorn Next year both of us doing an Agile SAP story at #sapteched10 #sapteched09? http://twitpic.com/nd549 - Live story on SAP NetWeaver BPM at L2. Story by Eneco and Creetion. #sapteched09. Preparing for last day at #sapteched09. First have a breakfast at my hotel. It was already a great event to learn and to meet the community. Finished BPM264, good session. Hope I can reproduce it at home. Now time for evening event at #sapteched09. @luislanz Too bad that we can not meet at #sapteched09. 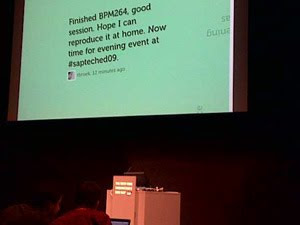 OK advanced sessions should skip intro and marketing slides on BPM and SAP NetWeaver, let's get our hands dirty @sapteched09. Final session for today: BPM264 async communication with SAP NetWeaver BPM at #sapteched09. Now attending BPM262: BPM integration with Visual Composer. Hope this one is really advanced ;-) #sapteched09. "This was my last slide": Great end of a presentation at #sapteched09. At 13:30 live interview on #sapteched09 http://bit.ly/Y4C6C with @marilynpratt, Wout, Caspar and me about #bpxslam09. RT @thorstenster: @tbroek Better than check-in-check-out, isn't it? << #Gravity is so much better!! @thorstenster Sure! Even worked with it for #bpxslam09. Great stuff #gravity for collaborative modeling. Now Simple Sample Applications at BPM260 #sapteched09. Great BPM260 showing test data for enterprise services. That will sure save time in finding the right service for your process #sapteched09. @erwintenhumberg What session are you in? Even the end result is for BOBJ at demojam #sapteched09. Congrats! RT @wolf_gregor: in my demo you would have seen SE80 and eCATT :-( http://bit.ly/SeleniumABAPBlog #sapteched09 >> Too bad we missed that. Who will be the winner, Yowie or No hands? #sapteched09. Live demo with picture taken of demojam crowd at #sapteche09. RT @se38: Need a Yowie Robot in #gwave #sapteched09 << There it is! Yowie is social SAP. Great demo with a ' Schnitzel store' in Vienna :) #sapteched09. And again BOBJ and Xcelsius are taking over the #sapteched09... What's wrong with developing in SAP NetWeaver? RT @ewH: The next time I see an iPhone at demo jam, I hope its in a "will it blend" demo #sapteched09 << Currently live the next entry. DemoJam BOBJ submission for #sapteched09 is only showing not developing. Still nice demo on iPhone. @wolf_gregor Hey you're still with us as @ccmehil is mentioning you at demojam09 #sapteched09. @rhirsch Ring a bell? Look familiar? Come back to that later, with 2 min left :D #sapteched09. Live music for DemoJam, great preparation at #SAPTechEd09. @erwintenhumberg Great so far, now in the middle of BRM. 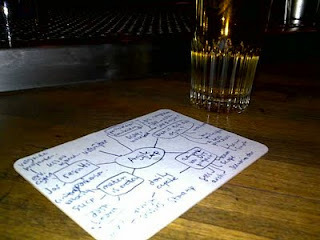 Concept is great, usage is area of attention. @ttrapp Sorry guys, still in BPM160. @finnern Still in BPM160, thought you would start at 18:00? Is there another timeslot? RT @thorstenster: @wolf_gregor Tonight at the #demojam we should keep 6 minutes of silence...#sapteched09 << and have a beer on your health! 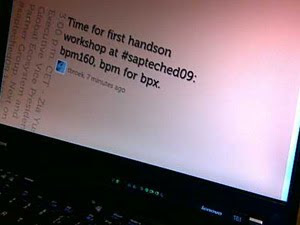 http://twitpic.com/n53q0 - New style BPM and very old style mouse ;-) at #sapteched09. @NopaTechEd09 Use ubertwitter for your blackberry - great tool! Time for first handson workshop at #sapteched09: bpm160, bpm for bpx. Skipped my first session to prepare for #bpxslam09 at #sapteched09 “<<“ going to be a great event tonight! http://twitpic.com/n4km4 - Great demo from Ian at #sapteched09 << this is SAP NetWeaver! OK really missed @sagassi and Ian at #sapteched09 during keynote. What about BPM or Web Dynpro for ABAP at #sapteched09? Am I that impatient? Business Objects taking over #sapteched09. SAP NetWeaver is much more than BO, BI or dashboards. Now looking at collaboration demo at #sapteched09. 12sprints.com is that sap stuff? Great bobj integration. Anyone also missing @sagassi at #sapteched09? Keynote #sapteched09 about speed of change? In stead of ppt with figures I like to see real SAP stuff, come on. We want some live demo's during keynote #sapteched09! #sapteched09 is for Training, Connections and Inspiration according to @markyolton. @NopaTechEd09 Where are you seated? @wolf_gregor Too bad, sad news. get well soon! Almost keynote time at #sapteched09, already spotted some famous mentors, gonna shake some hands now. Checkin at #sapteched09, no pen, no notepad, no bag. Hmmm economic recession??? Bit cheap though. Having troubles with #sapteched09 agenda. All sessions were imported in Outlook, but not synchronized to my mobile :-( Lot of manual work. @HarryFTF Thanx, keep you posted via twitter. http://img.ly/926 - Great pre- #sapteched09 experience. http://twitpic.com/n1qna - Paul proudly showing his badge with Oxolution, fresh name of his own company. http://twitpic.com/n1q57 - Great service #sapteched09 checkin at Vienna airport. - Thursday 29 October at 14:00. Between brackets the results from 2008. Java dropped down to #8, ABAP raised to #3. Investments in ABAP paying off? SOA is falling down to #6. The hype is over? BPM lost one place to BI. I would have thought that BPM would climb some places this year. (*) Disclaimer: This Top 10 is a result of filtering the Title column on specific words. It is for fun only and I do not claim that this is the single truth. By the way we also appear in an expert (what about that ;-) panel discussion on Agile development and Service Orientation. Last Friday we celebrated 12,5 years of CIBER NL. The band was formed by 10 colleagues. A good atmosphere and a good party! With SAP TechEd season coming up, this is a great video to have a look behind the scenes from last years SAP TechEd. Last Thursday was my first webcast at SDN: Agile SAP, Mission Impossible? The replay is, just as the other sessions, available on SDN. On the last slide some interesting links to more information are available. During the session some questions arose in the chat window. Use cases instead of user stories: We thought that user stories are very well applicable to web environments. But in our situation we also had a lot of backend functionality and processes to be realized. Therefore we decided to model everything with use cases. Bigger size teams (>=100): Our team developed 1/3 of the total solution. The other teams did not work according to scrum. But if they did there is a scrum of scrums approach to share the information of all the scrum teams. Dagfinn Parnas: "scrum does scale very well, but it does require some extra thought with regards to organization, tools etc. Craig Larman has a few good books on the topic. Using Scrum with non collocated teams: We were all located together, one of the biggest advantages for the project to minimize communication issues. So no experience yet. With online dashboards and nowadays conference call possibilities it can be made a success. As long as you keep to the basics of the approach: Working together during all phases of a sprint. I am curious to hear on experiences using Scrum and an offshore team. How did the SAP team work together? An ABAP developer will not do CRM customizing. That's for sure. But everybody can help designing the solution, documenting and testing it. All team members are expected to help each other. We saw some pair programming activities during the project: CRM and ABAP consultant working together. Resourcing scrum team: A project running at high speed needs a team that is almost 100% available. If not, people will miss a lot and have to catch up every time when they are back. Make sure that people that enter the team somewhere during the project that they get a proper introduction on how business is done within the scrum team. Best advice according to Harald Reiter: Go out and do it! Thanks to those who were attending my session. Feel free to share your thoughts on this topic with me. An SDN webcast open to everyone who is interested. After my slides I hope to have an interesting discussion with fellow SDNers on this topic. This will be my first webcast, I will try to prevent any technical flaws ;-) Follow the Twitter updates to get the link where the session is broadcasted. During the SAP TechEd in Vienna I hope to find a timeslot to organize a meet up with other agile enthusiastic participants. Maybe we can find each other in the community clubhouse and have a cappuccino together. First mine: A recipe for an SAP SOA project: from spaghetti to lasagna. Then Sander: Designing service oriented projects with smart use cases. Applying Agile to the world of SAP projects, well that is an impossible mission. Right? Lots of die hard SAP people still believe so. Even so described by the ASAP project approach. I personally feel that this is going to change very soon, just as SAP projects are changing rapidly with all the possibilities that SAP NetWeaver as business process platform is offering. 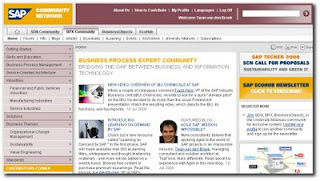 Please share your experiences on Agile and the world of SAP as a reaction on this blog or on our Agile SAP twibes. 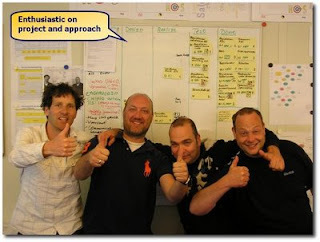 In my blog on doing the SAP Scrum I described that we wanted to follow the Scrum approach for the second phase of the project. In the first phase we lived according to the traditional waterfall method and experienced the traditional issues. Now we are three weeks on route and this week we started our first realization iteration, our first sprint. The past three weeks we focused on delivering the product backlog, the scope in deliverables so to say. Scope that is to be realized with SAP BPM, SAP XI, SAP CRM, ABAP and some minor (*) web development. Now I would like to share some experiences that we gathered over the past three weeks. (*) Main focus is to realize backend components for an administrative process. So we decided to go for a Scrum, an agile approach that does not foresee in documentation templates. We had a scenario document that described the desired processes. On base of that we created sequence diagrams and with our agile coach Sander Hoogendoorn we decided to use Smart use cases to model our deliverables. With a training for the team we got up to speed and on the same knowledge level. After modeling it was time for estimating the use cases. Not in a traditional way of thinking how much time was required to realize, but with points. These points identify the complexity. As a team we decided per use case how many points were to be assigned: 1, 2, 3, 4, 5, 8 or 10 points. Ten points for either very complex stuff or for use cases with still some unclearness in it that has to be resolved before assigning the real points. And interesting to see that team enthusiasm goes up and down, it is new to every member of the team. Within the SAP world agile is not wide spread (yet). So it is understandable to hang on to processes and approaches that someone is used to. However with the time we have left to our final delivery mid June, I still believe this agile approach is our only option. Oscar Mulders, a colleague, posted an article in Computable, a Dutch IT magazine. "Customers do not ask for SOA, they long for the expected business advantages"
"Service orientation combined with BPM means shortening the throughput time and less effort required"
You can read the whole article at the Computable site (In Dutch). 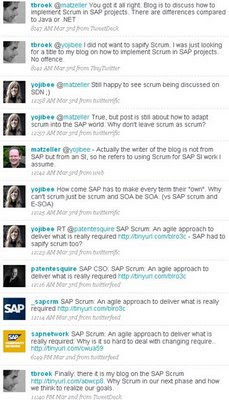 Well I am a bit flattered that @yojibee thought that I was an SAP employee ;-) With "Doing the SAP Scrum" I was only looking for a catching title. 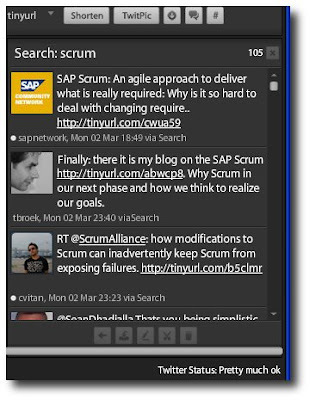 Today I finally finished my blog on the SAP Scrum. We started the second phase of the project by doing things differently, not the traditional waterfall but doing a Scrum. Why is it so hard to deal with changing requirements? Why is time pressure in a project forwarded to teams that are last in line, like developers and testers? Read more in SAP Scrum: An agile approach to deliver what is really required. On January 13th we gathered for our TopForce Knowledge Night: SAP NetWeaver CE 7.1 EHP1 install party. Goal was to get the CE installed and running on the participants (16) laptops. After installation we planned to build the demo scenario as described in my SDN blog Easy process implementation with SAP NetWeaver BPM. Quite a full program, and we almost made it to the end. As we had to leave the office at 21:30 sharp we ran out of time and could not deploy and test run the application. Despite that we had a great evening with a lot of fun, strange issues (with 16 laptops you can get 16 different error messages) and new SAP NetWeaver BPM enthusiasts. Temperature is rising, will it work or not? See Tim looking really seriously to his process composer "Great stuff". Installing the downloaded SAP NetWeaver Developer Studio is even more complicated. Lucky for us that is described very well in the manual as well. But it is still strange that after installing you immediately have to update the installation. It took some time to get the movie recorded and uploaded to the internet. Finally my demo scenario of the last two posts is visible available in a tutorial movie on BPM/BRM. I hope it will help you explore things in the new SAP NetWeaver BPM world, despite the fuzziness of the movie. I have added it to the SDN blog, Easy process implementation with SAP NetWeaver BPM / the BRM sequel. Pff, thanks to Arti from SAP Product Management BRM I found out that my BRM troubles were caused by my download release of SAP NetWeaver CE 7.1. I was using: Build id: 200809132152, downloaded in October 2008. After a fresh download and a complete re-install of CE, I am now using Build id: 200811082206. Installation of both CE and the IDE is still nog plug and play. But fortunately a very well written manual is delivered with the download: Install&Configure_CE_Preview71EHP1-Dec2008.pdf. When you experience an error during the CE installation, just click 'Retry' somewhere around step 20. And do that again when the same error pops up. That did the trick during my installation. I started the installation at 11:06 and it was finished at 12:42, including starting up the CE environment. A new record, 1,5 hour! The new installation resolved my BRM issues and you can read more about this in my SDN blog: Easy process implementation with SAP NetWeaver BPM / the BRM sequel. During SAP TechEd08 I really got enthusiastic on SAP NetWeaver BPM, formerly known as Galaxy and in 2008 again branded as Galaxy. Especially the integration of the Business Rules engine made me want to try this at home. Personally I feel that BRM is not optional within BPM, it is not a feature, it belongs to the total concept of process orchestration. Without it, BPM is not complete. So I built a BPM demo for the TopForce Learning Day. A recap of this demo can be found in my SDN blog Easy process implementation with SAP NetWeaver BPM. A simple process but effective enough to show the power of the concept. Creating a new context is a bit strange, re-using is better/easier. But anyway I tried as I can no longer think of any other options myself. Unfortunately I can’t get it to work. The process will start but the rule does not behave as expected. Every expense statement gets rejected. The one thing that is different compared to what I heard during TechEd08 and what I read on SDN, is that I implemented the rule directly in BPM. 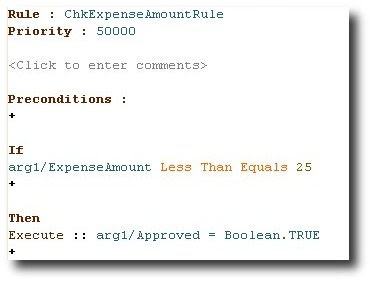 I did not create a stand alone BRM application that contains the rules and gets called via Java code in a Web Dynpro application. Maybe it will work that way, but that is not how the targeted users of BRM want to implement business rules. They, the BPX-ers, don’t read or write Java code. They orchestrate the business process and rules should be directly implemented while modeling the process. Who has the answer or solution? I personally think that the integration of BRM within SAP NetWeaver BPM is not finished completely.